Hello, we're eQuivalents. We're all about playing awesome tunes and getting you on your feet. We know audiences have diverse tastes (we certainly do!) so if you come to see us live you can expect rock anthems, pop hits, cult classics, 2 tone, reggae and much more. 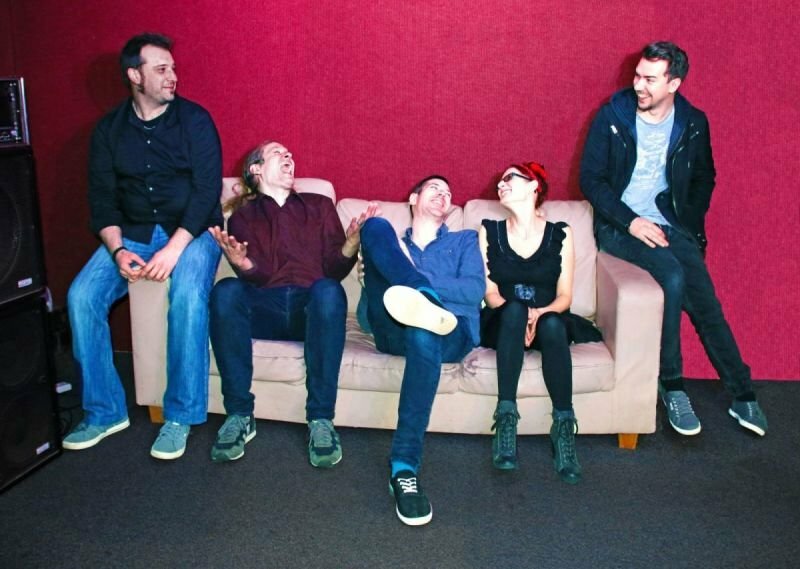 Whether you love The Killers, Franz Ferdinand and Daft Punk or you’re more of a Madness, The Specials and Bob Marley lover, eQuivalents won’t disappoint. We take a great deal of pride in what we do and rehearse and perform regularly. We have experience playing pubs, social clubs, birthday parties, weddings and everything in between. Typically we play 2 x 60 minute or 3 x 40 minute live sets but of course we're flexible. And we can provide a FREE DJ playlist between sets which means non-stop partying! Any questions? Just drop us a line via the contact form, email us at equivalentsband@gmail.com or call us on 07790433972. Hope to see you on the dance floor at one of our gigs soon! Based in London and happy to travel, eQuivalents are available for weddings, parties and all other events throughout the UK. This is our current repertoire which we're adding to all the time. Top night, good tunes and accommodating to the audience requests. Made my stag do a good one! Hopefully back there soon!! This was The Equivalents first time at The Hightown Club and boy did they rock the joint. Not a band to stick to one genre or decade, knocking out soul, ska, funk, reggae, rock and pop classics one after the other. Nor are they ones to play the safe options songs-wise, playing everything from Madness to XTC - their take on Making Plans for Nigel was uncanny to the original version. As one member said on the night "The Best Band of The Year". Looking forward to getting these guys back at The Hightown very soon. Just want to thank you guys for a fab New Year's Eve. Highly recommended, professional band, perfect for any venue. I trudged to my local on a wet Saturday night expecting to hear the usual brand of bland covers band and got blown away by the technical brilliance of the eQuivalents, who really sounded like the bands whose tracks they played, and this talented bunch of musicians were giving it their all. Most bands play one kind of music, sticking to one genre, but that wasn't the case here. The eQuivalents dished out servings of Glam, Rock, Pop, Soul and Dance music with even some Ska and a bit of Reggae thrown in for good measure, leading their audience through the years sampling tracks from all the decades. I particularly enjoyed their version of "Le Freak" by Chic, which was performed very well sounding impressively close to the original, and was transported back to my youth when they later included two hits from Pulp in the form of "Common People" and "Disco 2000". I also got the feeling that this was a band more than capable of motivating their audience onto the dance floor, and I'd love to have heard more dance stuff included in their gig. As it is, I can recommend you check these guys out if you want something different from the norm. You won't be disappointed. I'll certainly be checking the local listings with a view to coming back for more. Thanks everyone who came down and made it such a great night for us. Give this band a like, they were amazing last night, and will be back soon! You guys are the real thing! So much better than the usual bands that play here - but don't tell them that! You were amazing! When's your next gig? I'll be there! "You guys are on fire... you can't just STOP playing... best band I've ever seen here!" Thank you so so much, you really made my night! When are you playing next? Hey guys - I'm only 22, but I loved every single tune you played tonight. You are amazing! You are so lucky! You get to play in the best band in the world! Looking forward to helping make P and K's wedding day even more special. Returning to the Dome, with our brand new bass player Tez. Don't forget those dancing shoes. Our first visit to this great venue in Windsor. Looks like a smasher! It's free entry and a late bar. Hope to see you - and your dancing shoes - there! J and his family and friends are going to have an amazing party! Honoured to be part of it. Another new venue for eQuivalents and are we looking forward to playing this great boozer? Oh yes! It would be lovely if you - yes you - joined us. Best pub in the area. And the crowd are always up for it. See you there! Great boozer in the 'Stow. It would be lovely if you joined us for a boogie. Delighted to return to the Bridge for a 90s themed Halloween party. See you there in your best costume! Looking forward to this birthday party at the Royston! Delighted to return to the Bridge at the end of the year. See you there, in your dancing shoes of course! Good old Black Horse. We love playing here. Come down, say hi, have a cheeky shandy and a boogie. Fab ye olde pub, we always have a blast here. Recommend you get yourself there and have ye olde blaste too. Can't wait to play the Kings Arms again. Lovely old time! Very nice gaff in Watford, Time for those dancing shoes again. Phew! Great place to play, great place to chill, and great place to conquer the dancefloor. See you there! HELLOOO WATFOOORD! This one is always a good one. See you there! Beautiful pub, top crowd. Come and shake your stuff with eQuivalents! Get ready for eQuivalents to hit Finchley. You know what to do (hint: it involves your dancing shoes)! eQuivalents very much look forward to playing our first time at the White Swan. See you on the dancefloor. We're delighted to have been asked back to this great pub in Watford. Live music is quite new here but it's sure to take off. Lovely atmosphere and plenty of room to dance! eQuivalents do their thing - or thang, if you will - at a new venue (new to us anyway). Your job is to do your thing - or indeed, thang - and get down to that dancefloor. Thong optional. Delighted to return to the great crowd at the Black Horse. First time at this North Finchley establishment. Looking forward to it. It's time to rock at the Crock. Can't wait to hit that stage! There's a great big dancefloor so come and do your thing. We are looking forward to returning to the Hightown Club! St Paddy's knees-up here at the cosy Prince of Wales. eQuivalents are pleased to return to this fine establishment in Barnet. See you there! Come and have a boogie at this great pub! Delighted to return to the Bridge. See you there! Looking forward to this! We really like this venue. Bring dancing shoes. Our first time at the lovely Black Horse in Greenford. Get your boogie shoes on! HOW DO I BOOK EQUIVALENTS? Get in touch via the contact form, equivalentsband@gmail.com or phone on 07790433972. This varies depending on the location of the venue, event timings and length/number of sets we play. Get in touch with some details and we will give you an instant quote. WHY SHOULD I BOOK EQUIVALENTS? There are countless other bands to choose from so why us? We take a great deal of pride in what we do. We rehearse and perform on a regular basis to make absolutely sure we're ready to party with you and your guests! Of course we love playing all the classics but we also aim to stand out from other bands, playing the occasional unexpected but awesome track. Have a look at our ever-expanding set list. Above all, we are committed to putting on a show that'll have you and your guests on your feet! IS THERE ANYTHING I NEED TO CONSIDER WHEN BOOKING YOU? We need access to mains power and ideally a performance area 4m wide by 3m deep minimum. Other than that we are self-contained and bring all our own equipment, including LED stage lights and state-of-the-art PA.
WHAT IF THE PERFORMANCE AREA IS NOT ON THE GROUND FLOOR? That's not a problem though the nearer we can get to the performance area to unload, the easier and quicker the process is for everyone. Of course! We love playing outdoors. However for safety reasons we need to be able to keep our equipment dry should the weather turn, and we'll need safe access to a power supply. WHAT HAPPENS WHEN YOU ARRIVE AND HOW LONG DO YOU TAKE TO SET UP? Let us know if you have any special requirements. We need roughly 1 hour 15 minutes to load in, set up our equipment and sound check, though this can vary depending on ease of access etc. In any event we always endeavour to set up as efficiently and with as little disruption to you as possible. DO YOU ALWAYS PLAY THE SAME SONGS? We sometimes have a set list but we also like to choose songs as we play, reacting to the crowd. Please do tell us your favourite songs from our ever-expanding repertoire. And conversely, if there are any songs you REALLY DON'T want us to play, please let us know! CAN YOU LEARN TO PLAY MY FAVOURITE SONG? We love learning new songs and if we're confident we can do your favourite song justice we will play it! WHAT HAPPENS WHEN YOU FINISH PLAYING? We'll be sad to say goodnight! It takes us roughly 45 minutes to pack down our equipment and leave the premises. Ordinarily we split our show into either two sets of 60 minutes or three sets of 40 minutes, but this is entirely adaptable to your requirements. WHERE ARE YOU BASED AND WHERE ARE YOU WILLING TO TRAVEL? We are based in London but are more than happy to travel.